Join us for the farewell edition of our most demanding running adventure  a high mountain challenge ascending 10 passes over 15,000' in just 7 days! Please note: This event will not be confirmed until we have at least 25 to 30 reservations. If you are interested, you should send your reservation! Because of the complex logistics of this adventure we do not plan to offer it after 2008. 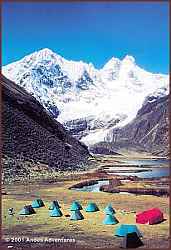 $2,595 including ground transportation in Perú; all meals, hotels, first class camping and full mountain support. See detailed itinerary for complete information. The trip consists of two adventure runs in 16 days! The first portion of the trip will be running a 40 mile multi-day circuit in Cordillera Blanca, the highest tropical mountain range in the world. The range - only 80 miles long - contains more than 60 peaks over 18,500', with 20 peaks over 20,000', including Mount Huascaran (22,205'), the highest in Perú. Our adventure begins in the mountain town of Huaraz. After a night of rest in Huaraz, we depart to the town of Chiquian to run a 100 mile multi-day circuit of the Cordillera Huayhuash. 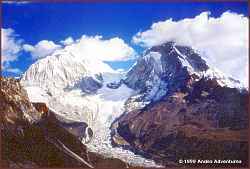 The icy, jagged edged Huayhuash range is only 25 miles long and it contains 7 mountains over 20,000', including Mount Yerupajá (21,765') the second highest peak in Perú. 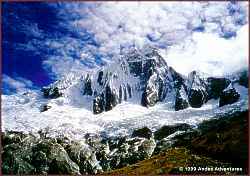 The range is so compact that we will have continuous views of its glacier covered peaks. This trip is extremely strenuous with 10 passes over 15,000', the highest at 16,500'. Its imposing summits, transparent turquoise glacial lakes, waterfalls, crystal clear rivers, mountain streams and remote traditional villages make this adventure one of the most exciting mountain destinations on earth. Optional extension to Cusco to run the Inca Trail Marathon to Machu Picchu  August 2008. See the itinerary for additional details. 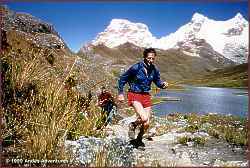 "Blanca & Huayhuash Adventure Run" Photos by Chuck Baughman. Click Here for Photos. From July 2001. © 2000-2016 Andes Adventures, Inc. All Rights Reserved. Celebrating our 22nd year of extraordinary value in Adventure Travel. Plan your 2017 Travel Adventure today! including, weather, road or trail conditions and flight schedules.